Automotive Radar Market size was valued at over USD 1.9 billion in 2015, with 18.7% CAGR from 2016 to 2024. Rising safety needs among consumers will catapult automotive radar market share from 2016 to 2024. In 2015, the U.S. NHTSA (National Highway Traffic Safety Administration) announced mandatory installation of AEBS (Automatic Emergency Braking Systems) into cars beginning with model year 2018 in order to prevent crashes. Safety has emerged as a primary concern for passengers and pedestrians as the number of road accidents and fatalities continue to rise. According to ASIRT (Association for Safe International Road Travel), around 1.3 million people lose their lives due to road crashes every year, which represent an average of 3,287 deaths per day. Road traffic crashes account for 2.2% of all deaths and is the ninth leading cause of death globally. In order to reduce medical costs, traffic crash prevention has become a prime concern among public around the globe. According to the Insurance Institute for Highway Safety, one out of three fatal crashes can be mitigated if passenger vehicles are equipped with collision avoidance systems. Sensor systems that offer enhanced safety features mainly include autonomous braking, forward collision warning system, adaptive cruise control, lane departure warning, adaptive headlights, blind spot detection, backup camera, parking assistance, reverse sensors, and side-view assist. 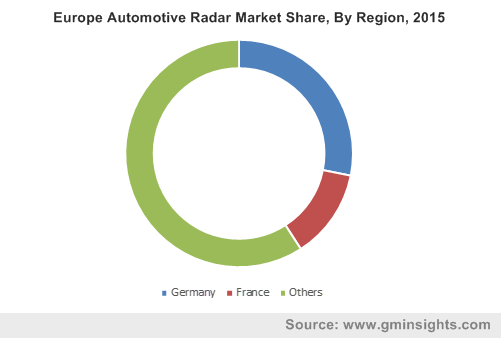 Rising consumer awareness regarding features such as high commercial acceptance will drive automotive radar market size over the next eight years. High price associated with these systems over piezoelectric or pressure sensors could pose a threat to the market size. Advanced active sensing technology adds to the vehicle cost, making it expensive for both the vehicle manufacturer and consumer. Autonomous and self-driving cars rely on multiple sensors that are not only expensive, but also customized to suit the driverless car system. Advanced sensor systems based on radar, laser or infrared are exclusive and often installed as an add-on to the motor vehicle. Falling sensor prices owing to microprocessor-derived manufacturing methods, improved fabrication techniques, and technological advancements may help overcome high technology cost hindrance through 2024. Adaptive cruise control (ACC) accounted over 35% of the overall automotive radar market share in 2015 and is predicted to grow at 17.7% CAGR till 2024. This can be attributed to its flawless ability of monitoring and maintaining user-specified gap between the vehicles ahead. ACC is combination of long, mid and short range radars that is used to transmit data to the control unit. It complements vehicle styling and thus is only available in high-end luxury cars. Blind spot detection (BSD) application is estimated to grow at 19.1% CAGR through 2024. This technology alerts the user when another vehicle enters into the blind spot, providing more time for drivers to react against obstacles which are not clearly visible in the rearview mirror. Major automakers have started to integrate basic collision avoidance systems into their mass-market models. For instance, Toyota unveiled various technologies that encompass auto-parking, auto-adjust headlamp, pre-crash braking packages, and vehicle communication system to be incorporated into its 2015 models. China automotive radar market share will drive Asia Pacific revenue in the coming years. High vehicle production and sales across the region justifies the industry scenario. Europe market share is set to grow at over 17.5% CAGR from 2016 to 2024. Suppliers focus on developing economical systems that are enough for mass-market vehicles could further catalyze the industry scenario. For instance, in 2013, TRW introduced its low-cost and mid-range radar sensor, ACC 100. The company was awarded a contract for supply of sensors, full system integration and functional development of technology in the Peugeot, Citroen and DS vehicle ranges, with production starting in 2017. Insurance companies are also taking significant interest in commercializing collision avoidance sensors in order to reduce the liability claims caused due to road accidents. Major industry participants contributing to automotive radar market share include Infineon, STM and NXP. Other prominent players are ZF TRW, Valeo, Texas Instruments, Robert Bosch, Hella, Fujitsu, Denso Corporation, Delphi LLP, Continental, and Autoliv. The industry is characterized by frequent mergers & acquisitions and next generation technology development. Federal Motor Carrier Safety Administration (FMCSA) has set out a goal to reduce the number and severity of commercial motor vehicle crashes by collaborating with the truck industry in order to facilitate, test and evaluate the use of on-board safety systems. Innovation in image sensing technology and falling camera prices are driving adoption for camera-based sensors over the forecast timeframe. The 3D image sensor by Infineon for automotive applications enables capturing 3D data which can be used for gesture control, driver state monitoring, passenger classification, optimized head-up display visualization and surround view for parking assistance and obstacle detection. Its major implementations are encountered in adaptive cruise control applications in order to detect vehicle skidding on sharp turns. These sensors automatically apply brakes when skidding is detected and the vehicle is automatically controlled. Hardware suppliers provide semiconductor devices, embedded processors, digital signal processors, ICs and related components. Sensors manufacturing often requires raw materials such as silicon wafers, imaging modules, packaging substrates, printed circuit boards and assemblies, mold compound, passive electronic components, and conductive inks. Raw materials are obtained from suppliers located throughout the world. Often materials are supplied on just-in-time basis to meet the current demand.